I seem to have found a lot of fabulous YA books this week, which have some fantastic covers. Three of them are faerie stories - always a favourite with me. 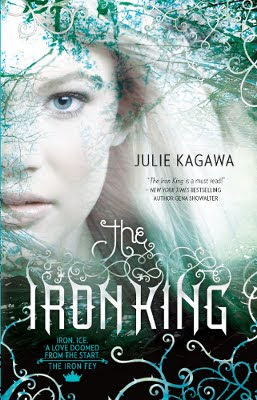 1) The Iron King by Julie Kagawa. I found this one over at Carrie's YA Bookshelf. I just love the cover on this one. Meghan Chase has always felt like a stranger in her own house. Her mother is usually busy and her stepfather barely remembers who she is half the time. The only person she feels totally and utterly connected to is her little brother. When her brother is kidnapped and replaced with a Changling, Meghan is forced to enter the magical world of the fey in order to save him. There, she finds out what has made her so different from everyone else around her. She learns she is the daughter of the Summer King and it is very dangerous for her to remain in Faery. There are those that would use her to get to her father, the king. With the help of a Winter Prince and a strange cat named Grimalkin, Meghan navigates the depths of Faery in order to save her brother and stay alive while doing it. Together Meghan, the prince, and Grimalkin come into contact with a dangerous enemy, the Iron Fey, and must tread lightly through unknown territory. It reminds a little of Wicked Lovely from the description,so I know I will want to read it. Here is the blurb from Fantastic Fiction. When Reggie finds an old journal and reads about the Vours, supernatural creatures who feast on fear and attack on the eve of the winter solstice, she assumes they are just the musings of some lunatic author. But soon, they become a terrifying reality when she begins to suspect that her timid younger brother might be one of their victims.Risking her life and her sanity, Reggie enters a living nightmare to save the people she loves. Can she devour own her fears before they devour her? It is described as terrifying and bone chilling. I do love a good thriller. I found this one over at The Hiding Spot. 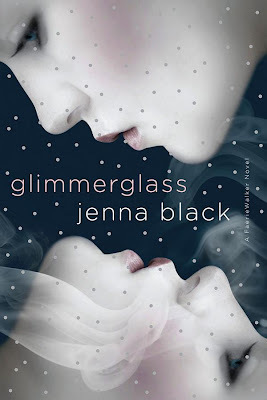 Here is the blurb from Jenna Black's blog. Dana Hathaway doesn’t know it yet, but she’s in big trouble. When her alcoholic mom shows up at her voice recital drunk, Dana decides she’s had it with being her mother’s keeper, so she packs her bags and heads to stay with her mysterious father in Avalon: the only place on Earth where the regular, everyday world and the magical world of Faerie intersect. But from the moment Dana sets foot in Avalon, everything goes wrong, for it turns out she isn't just an ordinary teenage girl—she's a Faeriewalker, a rare individual who can travel between both worlds, and who can bring magic into the human world and technology into Faerie. Soon, she finds herself tangled up in a cutthroat game of Fae politics. Someone's trying to kill her, and everyone wants something from her, even her newfound friends and family. Suddenly, life with her alcoholic mom doesn't sound half bad, and Dana would do anything to escape Avalon and get back home. Too bad both her friends and her enemies alike are determined not to let her go . . I found this one over at Paperback Reader . This is quite a new blog to me and I have really enjoyed reading it, so do pop over and have a look. I read one of her other books called The Mango Season, a couple of years ago and absolutely loved it. Between the pressures to marry and become a traditional Indian wife and the humiliation of losing her job in Silicon Valley, Devi is on the edge–where the only way out seems to be to jump. . . .Yet Devi’s plans to “end it all” fall short when she is saved by the last person she wants to see: her mother. Forced to move in with her parents until she recovers, Devi refuses to speak. Instead, she cooks . . . nonstop. And not the usual fare, but off the wall twists on Indian classics, like blueberry curry chicken or Cajun prawn biryani. Now family meals are no longer obligations. Devi’s parents, her sister, and her brother-in-law can’t get enough–and they suddenly find their lives taking turns as surprising as the impromptu creations Devi whips up in the kitchen each night. Then a stranger appears out of the blue. Devi, it appears, had a secret–one that touches many a nerve in her tightly wound family. Though exposing some shattering truths, the secret will also gather them back together in ways they never dreamed possible.Interspersed with mouthwatering recipes, this story mixes humor, warmth, and leap-off-the-page characters into a rich stew of a novel that reveals a woman’s struggle for acceptance from her family and herself. So there are the book I have found this week and hope to purchase soon. What wonderful covers some of these books have - Glimmerglass is beautiful, simply stunning. Would it be possible for you to include a link or address for the Friday Finds site? I'm having some difficulty tracking it down. Thank you. Petty Witter - if you click on the word here in the first paragraph it will take you straight to Friday Finds. You seem to have some good books. All of those books are very appealing to me and what great covers! Just the covers alone are awesome. Great finds! I just love these covers! 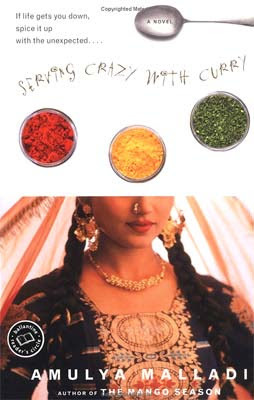 I tried Serving Crazy with Curry before I started blogging but I didn't really give it much of a chance at the time. I may have to try again one day. I've heard it compared to Chocolat by Joanne Harris though. I love those covers. May have to add them to my reading pile just because of the covers. Your Friday finds have a feminine look this week. They are all quite lovely. (And why am I now craving spicy Indian food?) Enjoy! The covers are absolutely stunning. Makes me want to read more YA books. Serving Crazy With Curry is the one that appeals to me the most. I like some fantasy, but haven't ever been able to get into books about fairies or changelings. Love the covers! You found some great books! The covers are too tempting to resist. I love that in YA. Actually, I love that in all books, but particularly YA as you have to sometimes twist a little to entice. Thanks for sharing your finds. Looks like some good books there. They all have terrific covers! you always find some great ones! they all sound good, especially Serving Crazy with Curry.